22,000 To Attend The Katowice Jolly! The jolly has now started in Katowice, and as usual thousands are going along. The UK’s delegation is led by Claire Perry, and consists of 52 bureaucrats. NGOs are sending more than 6000, all designed to put pressure on elected politicians. For some reason, there does not appear to be anybody representing ordinary people’s interests! 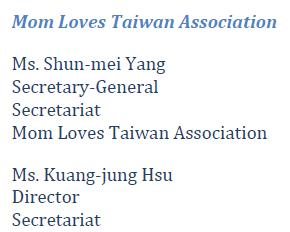 But there is room for the Mom Loves Taiwan Association!! 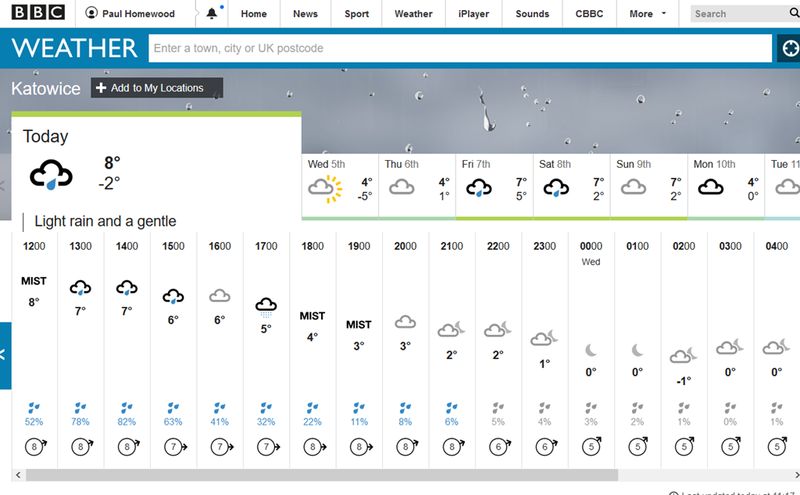 It’s going to be cold and wet in Poland this week. Winds are light and there’s not much sunshine. The supposed purpose of COP24 is to agree the “rulebook”, the details of how nations should implement the Paris Agreement and report their progress. 1) Money – how the $100bn a year of climate aid, which is supposed to start in 2020, will be funded, and who will pay it. In reality, the first tranche of $100bn, agreed in 2009 at Copenhagen and intended to be spread up to 2020, has still not coughed up more than a few billion. Most of it is in any event not new money. The chances of rich countries agreeing anything are zero. 2) Monitoring emissions – there is supposed to be regular “stocktaking” of emissions in each country, to see whether progress is being made. China has long objected to this being done by objective, independent observers, and this will not change. There will also be no agreement on mechanisms for delivering sanctions to states that do not meet their targets, not least because there is no provision in the Paris Agreement for this. The role of “big” states will also be up for discussion. Developed countries will be under more pressure to up the ante. However, the US will clearly veto anything on those lines. More significantly though, even the EU have made it quite clear that they will not improve their commitments, unless countries like China and India also accept more responsibility. There will be much whining from poorer states about how unfair it all is. And it will end with a totally meaningless declaration, which will kick the can down the road again. We can of course expect the BBC to present it as a giant step towards saving the planet. But when we get to COP25 next year Matt McGrath will have to admit how little this year’s shindig actually achieved. Coal accounts for 82.3% and gas a further 6.3%. Gordon Bennett! Just think of the carbon footprint of that lot, all in the purpose of bolstering up their air miles. 22k + hypocrites, every single one of them. The alternative looks so much better: don’t bother with the meetings, and spend the taxpayer money on real problems, such as fuel poverty. “Offsets”. Isn’t that like Monopoly money? Offsets are the modern indulgences. The irony is that it’s really only fossil fuels which keep the lights & internet connections on, for those 22k visitors. 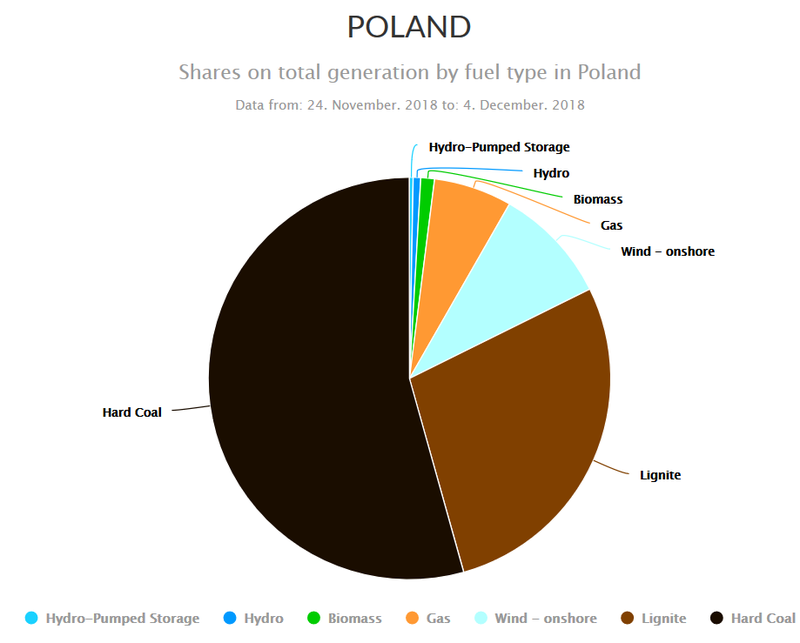 As I type this, 85% of Poland’s electricity is either gas- or coal-generated. At this time of year its probably close to 100%, because despite the claim of a BBC “expert” yesterday, solar does diddly squat in cloudy weather. And diddly-squat when the sun’s low in the sky, as it is for half the year and nothing whatsoever at night when we need it the most. Waste of space. What joy is this? can’t you sense the browbeating, all EU taxpayers should, particularly those sad poor benighted stiffs living here: in the UK. Donald Trump said no, the obarmy fashioned deal is a crock and how right he is. I wonder if, there is in Katowice – an Italian delegation rolling up? The US won’t be there, nor the Chinese, I doubt there’ll be much commitment from Brazil, and the French PM has pulled out to deal with far more important matters closer to home. Perhaps the other countries ought to take note. The French riots over a 25% rise in fuel duty will be as nothing when they find out what it costs to go ‘carbon-neutral’. 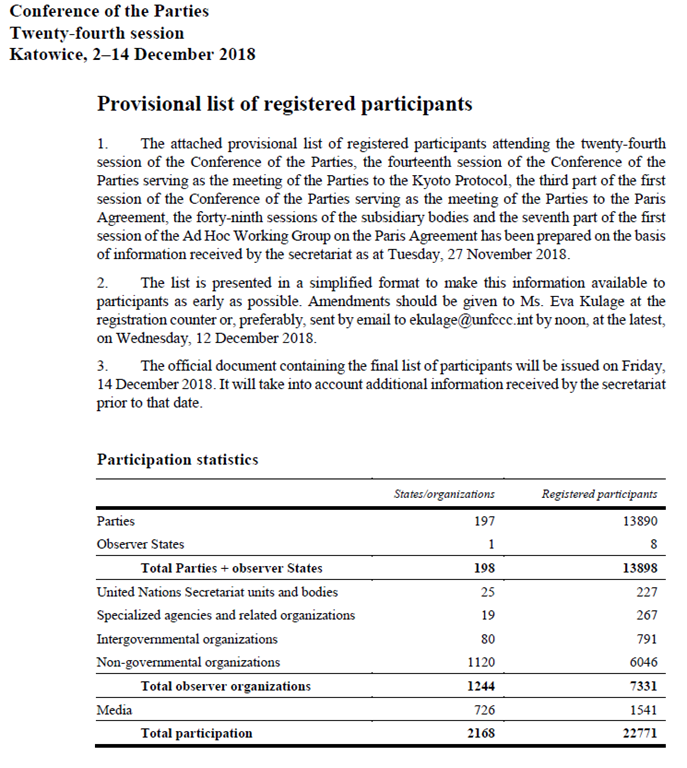 Perhaps you should try some research before you state that the US and China are not attending COP24 since they are on the freely available list of attendees. They will not be there in the numbers of the past, but they will certainly be there. The US climate establishment will not let this pass and they will be telling their global colleagues to have patience, Trump will soon be be gone (they hope) and then they can resume their rightful place. “We’ll be back” as a certain Swedish Californian might say. 22,000 Delegates! The sad thing is that if none of then attended the next conference, or the last one, then the world would be no different to what it is now, Sorry, we would all be better off than we are now! Are knives allowed in meeting rooms? On top of the Government and NGO reps we also have all those rich posturing “celebrities”, spelt a r s e h o l e s, who will also be berating us plebs for using too much energy and wanting to own our own cars and go on holidays etc. Biggest bunch of hypocrites in the world. David Attenborough made a speech based on comments on twitter using the hashtag #TakeYourSeat. I don’t use twitter, but I wonder if any sceptics sent comments, and if so, were those comments represented? Virtually all the comments look like the climate change cult only, complete with the pictures of children spewing the crap their parents and teachers told them to say (with a picture of the adorable child, of course), drawings and a plethora of “we’re all dead if draconian measures are not taken” (with zero understanding of what the means I’m sure). There was one comment about having the conference in a coal using nation, but it may disappear soon. I saw nothing “skeptical” in any comments, but I didn’t devote a lot of time to reading them. They just parrot each other anyway. While again holed below the waterline by your efforts it will make little difference to this orchestrated hysteria as all are stranded on a sandbank of their own making. All these people will be a drain on taxpayers too, all with snouts in the trough. It just shows how many organisations are hanging off this scam. 20K snouts in the troff. 20K people wasting other peoples money on worthess virtue signalling. Yee gods! 30,000 according to their own intro video. How much carbon will this lot release on their jolly. What a complete scandal the whole thing is. Attenborough is leading the ’emissions’ charge of the globetrotting climate whingers. He is a population controller: https://populationmatters.org/ As with many other social areas, the climate bandwagon is a means of advancing the agenda. Whilst this egregious waste is going on we are assailed by pleading adverts from UNICEF for more cash for starving kids here and now. The UN has never been more awash with our cash. Our government wastes a fortune on foreign aid. If kids are starving and it is physically possible to get aid to them, what possible excuse is there for needing more of our cash and not already having ‘saved’ them? The African Republic of Guinea must now realise how serious is the threat of climate changing, or (possibly more likely), that fewer $$$ will now be handed over to countries claiming penury. It has reduced its delegation size from the 492 bodies it flew to Bonn last year, to only 406 it’s flown to Katowice. A laudable reduction of 17%. If only all Paris signatories achieved a 17% emissions reduction in a year.